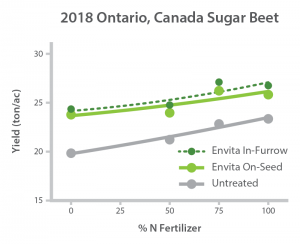 Envita increased sugar beet yields by an average of 14.5% (3.2 ton/ac) and 17.5% (3.8 ton/ac) for on-seed and in-furrow applications, respectively. Field trials carried out in Southwestern Ontario, 2 hours east of Michigan, used commercial pelletized sugar beet seeds. Treatments included Control, Envita™ in-furrow, and Envita on-seed with 4 levels of Nitrogen fertilizer (0, 50, 75, and 100% N). Treatment with Envita showed a highly significant yield increase compared with untreated sugar beet seeds across all levels of N fertilizer. Future field trials are planned to further document the yield benefits of Envita on sugar beets. To try Envita for yourself, register here.